A P J Abdul Kalam also known as ‘Missile Man of India’ is an Indian scientist and former president of India. He has developed the ballistic missile and launch vehicle technology in India and also has great responsibility in Pokhran 2 nuclear test. The full name of A P J Abdul Kalam is Avul Pakir Jainulabdeen Abdul Kalam. Abdul Kalam was born in Tamil Nadu on 15 October 1931 in a Muslim family. His father was Jainulabdeen (a boat owner) and mother was Ashiamma (housewife). Though his grades were average during his school life, he had a great desire to learn and study. Belonging to a poor family sometimes he had to help his fathers and brothers to run the house. 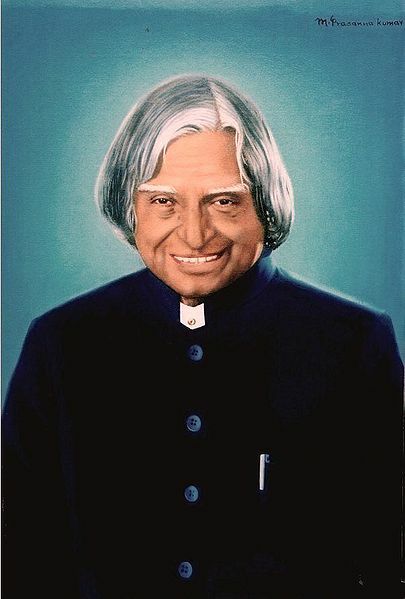 Kalam was the chief scientist in Aeronautical Development Establishment of Defense Research and Development Organization (DRDO). Later he joined ISRO in 1969. In 2002 he was selected as 11th president of India. Abdul Kalam is the first bachelor and scientist who occupied the Rashtrapati Bhawan. He successfully developed project polar SLV (satellite launch vehicle) and SLV 3. Rohini satellite was successfully placed in the near orbit of earth using SLV 3. Kalam has a great role in developing missiles Agni and Prithvi. He also played critical role in Pokhran 2 nuclear test along with R. Chidambaram. Abdul Kalam is also known as ‘People’s President’ sometime. Kalam is also popular in youth and he loves to spent times with them. In 2003 and 2006 he was nominated for the MTV youth icon of the year award. For his work in DRDO and ISRO he has received Padma Bhushan in 1981 and the Padma Vibhushan in 1990. He received Bharat Ratna in 1997.He is the third president in India after Dr. Sarvapali Radhakrishnan (1954) and Dr. Zakir Hussain (1963) who received Bharat Ratna before becoming president of India.